Whether you're reading a computer manual, or speaking with a computer repair professional, it's easy to feel like they're speaking another language sometimes. And in a way, they are. The technology world has an entirely different set of vocabulary, which can make explaining already-complex concepts that much more difficult. Today, we'll start simple, and try to tackle a few words that get tossed around (and mixed up) quite a bit in cyberspace. Website vs. Browser: A website is the term for a collection of web pages, which are documents written in hypertext markup language (better known as HTML). The HTML is then translated for you by your web browser, which is the program that allows you to access the web. For example: www.nytimes.com is a website, while Google Chrome is a browser. Hardware vs. Software: To distinguish between these two, all you have to do is look at the words themselves. Hardware is hard, because it's the physical parts that make up the computer, like the monitor, keyboard and, inside the computer, pieces like the motherboard and RAM. Software, on the other hand, isn't physical, but virtual. Software is what we call the programs that run on your computer, such as Adobe Reader or Microsoft Office. Upload vs. Download: If you upload a file, you are sending it from your own computer to another system. Conversely, if you download a file, you are receiving information from somewhere else. Chances are, you'll be downloading more than uploading, because most files are stored on internet servers these days. For example: You upload pictures from your camera onto Facebook, but you download songs from iTunes. 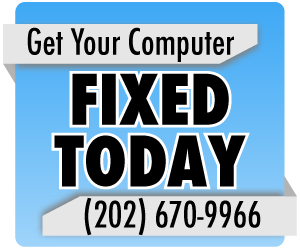 If you're still confused by a term, don't hesitate to ask a professional, such as your local Washington, D.C. computer repair service company. My Laptop Screen is Black! HELP! I Deleted My Document!